Napomyza lateralis (Fallén, 1823b); Spencer, 1976. Fauna ent. Scand. 5(1): 338-40, figs 616-9. 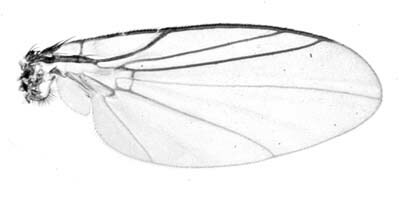 Napomyza lateralis (Fallén, 1823b); Spencer, 1990. Host specialization in the World Agromyzidae (Diptera) : 58, 150, 155, 207, 231, 251, 253, 259, 265, 274, 281, 290-1, 293, 295, 301, 302 (fig. 1167) and more. Stem-feeder : Larvae normally feed in stems but have been found in the inflorescence (Spencer, 1972b: 68). The larva is described by Dempewolf (2001: 179). Yellowish, elongate; posterior spiracles each with some 10 bulbs (without central horn). Comments: Spencer (1990) accepts a Napomyza species on Linum as representing lateralis. However, more detailed studies may show that this population represents a distinct species. Distribution in Great Britain and Ireland: Widespread and common. Surrey (Richmond), London (Hampstead), Hertfordshire (Brookman's Park), Inverness (Inverness) (Spencer, 1972b: 68); Caernarvonshire, Cambridgeshire, Dumfriesshire, East Cornwall, East Kent, Fife, Glamorgan, Huntingdonshire, Monmouthshire, North Hampshire, Nottinghamshire, Pembrokeshire, Shropshire, South Essex, South-west Yorkshire, Surrey, West Kent and West Suffolk (NBN Atlas). Distribution elsewhere: Common throughout much of Europe including Denmark, Finland, Norway, Sweden (Spencer, 1976: 340), Germany (Spencer, 1976: 566; Dempewolf, 2001: 179; Spencer, 1990: 150), Austria, Azores, Belarus, Belgium, Canary Is., Czech Republic, Estonia, European Turkey, French mainland, Hungary, Italian mainland, Latvia, Lithuania, Madeira, Poland, Sicily, Spanish mainland, Switzerland and Yugoslavia (Martinez in Fauna Europaea). Also recorded in Japan and Canada (Spencer, 1976: 340).